If you've got a pet you wish to take on holiday with you, you'll need to make sure that you holiday cottage you choose will allow you to take your dog along too. And this is why we've created this page for you. 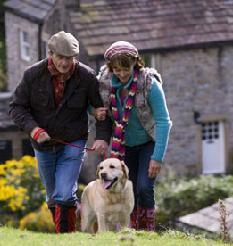 All the cottages featured on this page will allow you to take your pet on holiday. The pet friendly holiday cottages featured here are big cottages; ideal for those of you who are looking to holiday with friends or extended family - but also need a dog to able to join the party. The cottages on this page sleep between 8 people plus your pet and 12+ people plus your pet. All you have to do is select how many people are going on holiday with you, and we'll show you cottages which allow you to take your pet too. If you can't find anything which takes your fancy, why not look for a slightly larger cottage; so if you have 10 people in your holiday party, try looking for a cottage which sleeps 11, or even 12+ people. Choosing a larger cottage is also likely to give you more living space, which is always handy! If you want to look for a cottage which doesn't sleep quite to many people, have a look at cottages which sleep 5 to 8 people, or for smaller cottages try cottages which sleep 2 to 5 people.